I’ve been studying the cryptocurrency market long enough that I’m seeing the segmentation boundaries for the various types of investment opportunities. Three months ago, I outlined a v1 segmentation, along the traditional layers of Infrastructure, Middleware Services and Applications. I’m sticking with that segmentation, but have updated the bullets inside each one of these segments, based on my deeper understanding of the cryptocurrency market. Here’s the new segmentation that I see. 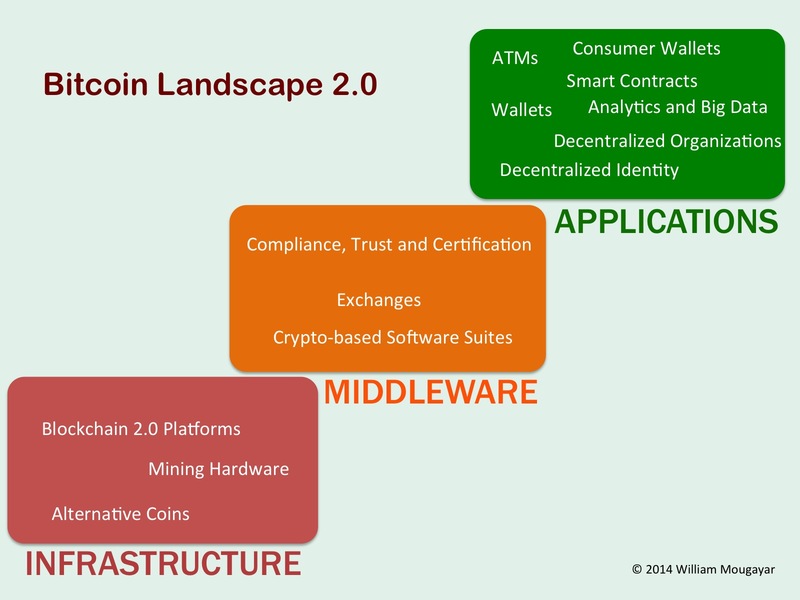 Blockchain 2.0 Platforms, including sub currencies or new currencies. These are entirely new platforms with a scripting language, and with a focus that targets developers who want to write crypto-based applications. E.g. Ethereum, Mastercoin, Invictus, Ripple, etc. Some are based on the Bitcoin blockchain, others use an independent consensus-based blockchain, and a new one uses a sidechain concept. Some are more advanced than others, but the proof will be in the apps they generate, the number of developers that are committed to them, and the ease of use and completeness of their solutions. Mining Hardware. There is no escaping specialized hardware for mining Bitcoin or other currencies. The latest hardware models are not cheap, nor are meant to be purchased by the average user. Alternative Coins. Slightly different from the Blockchain 2.0 platforms, these are simpler implementations where the focus is more on the currency propagation and usage, rather than building sophisticated apps on top on these currencies. E.g. Litecoin, Dogecoin. They are part of infrastructure in my opinion, because usage needs to exist on top of these alternative coins. Compliance, Trust and Certification. Who will be the Underwriters Labs, or JD Power of the crypto space? Lots of opportunities there verify and assert that the services offered are secure, authentic and with the required quality of service. Exchanges. There are different types of exchanges, including ones that also offer a merchant payment gateway, or are proxies to other exchanges. Crypto-based Software Suites with Services, e.g. a RedHat type for Linux, or Shopify for ecommerce. These are SaaS products that are a swiss army knife from spinning a currency, a DApp, on-blockchain services, etc. As of now, these don’t exist, but there are needed. ATM’s. One day, we won’t need specialized Bitcoin teller machines, but for now, that’s the only way to quickly withdraw or convert Bitcoins. Trading marketplaces. These will be the equivalents of what you can do on a stock market today. A slew of financial services such as Bitcoin derivatives, or real clearinghouses are lurking around the corner. Consumer Wallets. This segment is ripe for a handful of leaders to emerge. Currently, there are probably a dozen contenders, and another two dozen flavors of wallets. A leading wallet should be universal (support multi-currencies), include microtransactions, peer to peer direct money transfers, and have offline/online storage mechanisms. Arguably, your Bitcoin wallet is also your own bank, so it needs to be widely secure, easy to use and versatile. Decentralized Identity and Reputation Systems. A handful of options are emerging, such as NamecoinID or OneName but the business model is unclear. Clearly, only one system is needed, so this makes this segment a risky one, although a winner-takes-all approach is what’s needed. Decentralized Organizations with smart tokens and currencies (where tokens appreciate based on increased activity by users that raises the network value). Branded/corporate coins will be part of this segment. David Johnston has written the seminal paper, The General Theory of Decentralized Applications “DApps” describing this segment. It is conceivable that these types of decentralized organizations will touch a variety of facets, from specialized services, to industry-focused ones, and even country-specific ones. Analytics and Big Data. Still embryonic, but there has to be a play in analyzing the huge amounts of data that Bitcoin and cryptocurrency systems will be generating.